Yarra Council will consider trialling 30km/h speed limits in some streets and painting more roads and laneways bright colours to encourage and protect cyclists and other vulnerable road users. The council voted for the trial at its first meeting of the year on Tuesday, but a motion to rescind the decision has since been moved and further debate on the proposal will take place at the next council meeting on February 16. As part of the original proposal it is planned for roads across the inner city to be painted bright colours to remind motorists to expect cyclists and other vulnerable road users. Yarra Council voted to continue various forms of “psychological traffic treatments” to calm drivers, as well as the trial of the 30km/h speed limit in Fitzroy streets. A council report stated the treatments were becoming a “more popular and accepted approach” to dealing with the negative impact of vehicles. Treatments, including painted streets and informal roundabouts, aim to create uncertainty by encouraging careful driving by making the streets less “road-like”. In October, the council splashed almost $23,000 painting a laneway in Cremorne to let motorists know it was not a “typical road”. 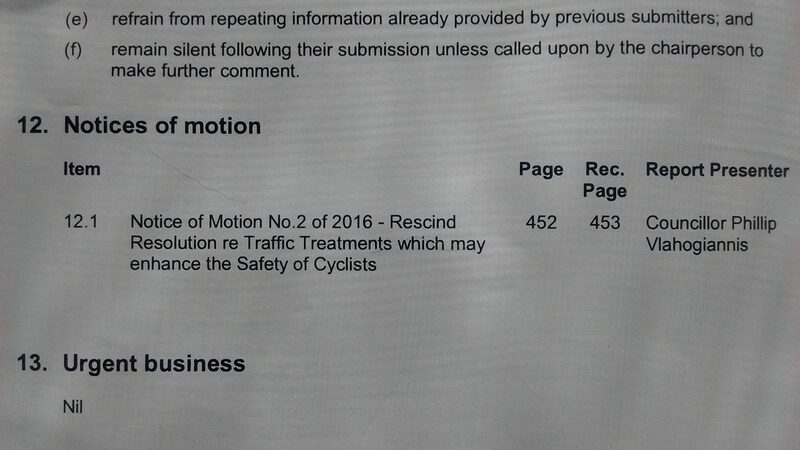 Other treatments proposed included removing road markings and the introduction of trees on the road. The council would look to fund the $25,000 30km/h speed limit trial, however any changes would need to be approved by VicRoads. The area that had been considered for the trial was in Fitzroy, bounded by Alexandra Pde, Smith, Johnston and Nicholson streets. The council became the first municipality in Australia in 2013 to implement 40km/h speed zones across all residential streets. A report states many overseas cities have moved to 20mph speed limits (32km/h), without traffic calming, resulting in more people taking up cycling and walking “due to increased road safety”. The council voted 5-3, with councillors Phillip Vlahogiannis, Geoff Barbour and Simon Huggins voting against the proposal. Cr Stephen Jolly was absent. There was no consultation when preparing the council report. At Tuesday night’s meeting Cr Vlahogiannis, who has now put forward the motion to rescind the council’s decision, said the community had been taken for granted. “They (the community) deserve to be given details about this so they can look at it and make comment on it in an informed way,” Cr Vlahogiannis said. Cr Sam Gaylard said 30km/h zones would help “entry level cyclists” feel safer. However, Yarra Bicycle Advisory Group’s Elizabeth Long said the group had not been advised about the move. Yarra Inspector Dean McGowan said a move to 30km/h would help protect vulnerable road users. But the RACV does not support the move. RACV manager roads and traffic Dave Jones said the move was impractical. “If there are a genuine road safety issues, the council should be spending money to fix the problem,” Mr Jones said. VicRoads said they would consider the proposal but considered 40km/h zones appropriate for high pedestrian areas.